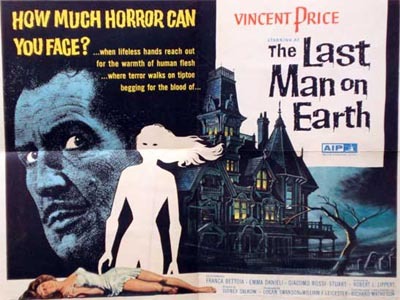 The Last Man on Earth is a solid early 60's B movie that features Vincent Price in one of his greatest roles. It's a story about a plague that turns everyone except Robert Morgan (Price) into vampires (that inexplicably behave like zombies). The creepy atmosphere is enhanced by being shot in black and white. The isolation and loneliness of Morgan is what really drives this film. We are taken on his daily routine of gathering weapons and killing vampires with wooden stakes before barricading himself in his home at night when they're active. This is when Vincent Price is at his best. His desire for companionship drives the 3rd act of the film and you really feel for him. There are some spooky visuals of the nighttime raids and some genuine chilling moments. There's no over the top gore, it's all atmosphere and storytelling. The ending is fantastic that will not disappoint. If you've never seen this one, give it a chance. While it's been remade (though technically it's based on a 1954 book) as The Omega Man and I Am Legend, this 1964 classic is the definitive take. Thanks to YouTube, you can watch the whole movie below for free!